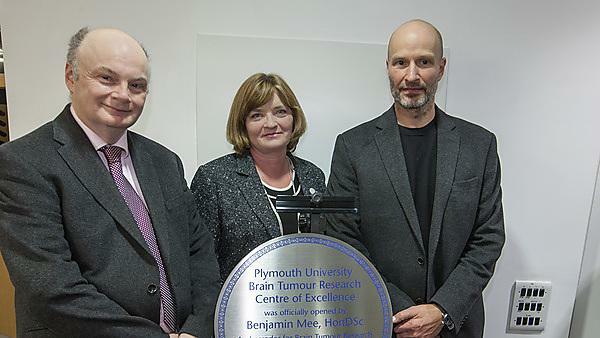 Patients, carers, scientists, clinicians, supporters and charities from across the UK gathered on 20 November for the launch of an historic new partnership between the charity Brain Tumour Research and Plymouth University. Together they have established a new Research Centre of Excellence, which will focus on low grade brain tumours - some of the most overlooked forms of brain tumours. Around 4,300 people are diagnosed with a low-grade brain tumour in the UK each year. Generally referred to as benign, these types of brain tumour – which include meningioma, ependymoma and acoustic neuroma – are graded 1 or 2 on a scale of 4. The lower grade tumours are non-cancerous whereas grades 3 and 4 are cancerous, faster growing and often more immediately life-threatening. Over 100 people attended the event. Guests included local luminaries such as: Ian Pawley and Barbara Vann from the Duchy Health Charity; Professor Mary Watkins and other trustees from the Peninsula Medical Foundation; Vice Admiral Richard Ibbotson (HM Representative for the Lord Lieutenant of Devon); Ann James (Chief Executive of Plymouth Hospitals NHS Trust; and others. The guests took tours of the laboratory and were given an insight into the workings of the research team. Poignantly many families and supporters whose lives have been affected by brain tumours were able to place tiles on the Centre’s new Wall of Hope, showing they are sponsoring a day or more of research. Guests included representatives from Plymouth University partners Plymouth Albion RFC, Plymouth Raiders, Devon Junior and Minor Football League and Santander, and their generous support was also acknowledged. The new Centre of Excellence sits within Plymouth University Schools of Dentistry and Medicine, led by Professor Oliver Hanemann. Already recognised as a leading facility in Europe looking at low-grade brain tumours, the team will be able to further advance to translational research – taking research from the laboratory bench to drug testing and clinical trials. This will include exploring potential for the repurposing of existing drugs to ‘fast-track’ potential treatments, instead of waiting for new drugs to be developed, tested and trialled and passed for patient use – a process that can take a decade or longer. By understanding the mechanism that makes brain cells become cancerous Professor Hanemann and his research team will explore ways in which to halt or reverse this process. The results from this research will inform investigations into high-grade tumours as high and low grade tumours share some common features. The team will work in collaboration with scientists based at Brain Tumour Research’s network of Centres of Excellence across the UK.